instagram: three reasons to use a camera instead of a phone. So I feel like I'm still really new at running my own business. I'm constantly learning and growing and trying out different things. I figured maybe as I learned new tricks, I'd share them on here with all you lovely people. I've always been drawn to photography so I think that's why Instagram became my major social media outlet of choice. I'd love to someday real soon create a feed that really represents my brand, is something that other creative are drawn to, and that my cool kids club can just keep growing with more and more rad individuals. I felt stunted for such a long time, trying to get my phone to take good pictures for Instagram posts. Now you absolutely can type into Pinterest or Google something like "taking good photos with iphones" and it will pull up probably a million different articles on awesome apps for taking amazing pictures. And I know lots of people who take exquisite pictures with their phones and totally rock at editing it all from your phone. But it just wasn't quite working for me. I would scroll through my feed and cringe at all the blurry photos or pictures where the color or quality just seemed off. So about a month ago I decided to try something different, using an actual camera instead of my phone. And I absolutely love it. And will probably never go back to using my phone to take my Instagram pictures because I'm weird like that. I mean I invested a lot of money (for me) in getting a good quality camera when I decided I wanted to pursue this etsy thing. And I seriously love this camera so much. I can't even imagine running my shop without it. So it hit me the other day, why am I struggling with my iphone when I've got this beautiful, fancy camera sitting in the other room? If I use this thing to take quality photos for my etsy shop and for my blog, why not use it for my Instagram too? I was almost always disappointed with pictures from my iphone. It was so hard to get good lighting and pictures always seemed slightly blurry. Now my phone case might be to blame for the blurriness but I'm too paranoid to use anything but a lifeproof case after that one time I dropped my phone in the kitchen sink while washing dishes and I lost the sound for several months (hah memories). Or maybe I'm just super wobbly. I don't know. But whenever I'd try to take my little hand selfie shots of me working on something for the shop, about half the pictures would end up kind of blurry or not as crisp as I'd hoped or definitely not centered. Something was just off. And I got sick of taking a bunch (try thirty-ish) pictures where only one or two would kind of sort of be up to my standards. And editing and comparing which photos to post in my little screen was just getting to be too much. Also, I was using up SO much memory on my phone with crap photos. Altogether it was taking up too much time and it just wasn't worth the hassle. Then a little light bulb clicked and I was like, "Megan...you invested good money in a good camera...you don't need to struggle like this anymore." Boom! Quality, crisp, beautiful, bright photos every single stinkin time. I have complete control now over lighting and angles and composition. No more awkwardly reaching above my head, trying to snap a bunch of photos. Well...sometimes I still awkwardly reach with my camera but still, it's so much better overall. I'm obsessed with the sharpness and quality of the photos I've been able to post ever since the switch. I'm able to adjust the exposure and shutter speed and get the style of photo I'd like almost right off the bat instead of messing with editing so much on my phone and hoping it wasn't too obvious that I had just edited a photo to death. Also, my camera is freaking fantastic and has a little feature that takes square pictures so I don't even have to crop them later. Thanks camera, you're such a doll! Since I take all my pictures with my camera now, I have the ability to edit all my photos the exact same way which is helping me to create a cohesive Instagram feed (which should be everyone's goal). This cuts down on so much time where I don't have to mess with different filters or switch from app to app, trying to find something that would work to get all my photos to look somewhat consistent. Now I just upload the pics to my basic little photoshop program, click a few buttons, and put them right back on my phone, perfect and ready to upload. I have a little series of steps I take each and every time I edit so it's a no brainer, so easy and so fast. I'm ready to upload in half the time it used to take for me to use my iphone. Before this, my insagram feed was all over the place. I've tried a lot of different styles and different apps and different filters. (For those of you who would still prefer to use your phone, my favorites apps were PicTapGo, VSCOcam, and Afterlight). And even then when I sort of settled on a style that fit my aesthetic, it was such a challenge to get those apps to fit the look I was going for. I don't know if I'm just overly critical but I can see a definite difference between shots taken with my camera versus my phone. I feel like I'm finally on a good path where I have good, quality photos and am building a cohesive feed where all my pictures look pretty great and work well together. I can easily still do my above angles that all us crochters/knitters love but I now have the option of putting both my hands in pictures which before was unheard of unless I happened to plan it so my hubby could help me. I probably look a little silly but I just sit underneath my tripod, zoom in the lens a bit so no one can see the tripods legs, click the remote control, and I have two seconds to hide the remote and grab my yarn or needle. 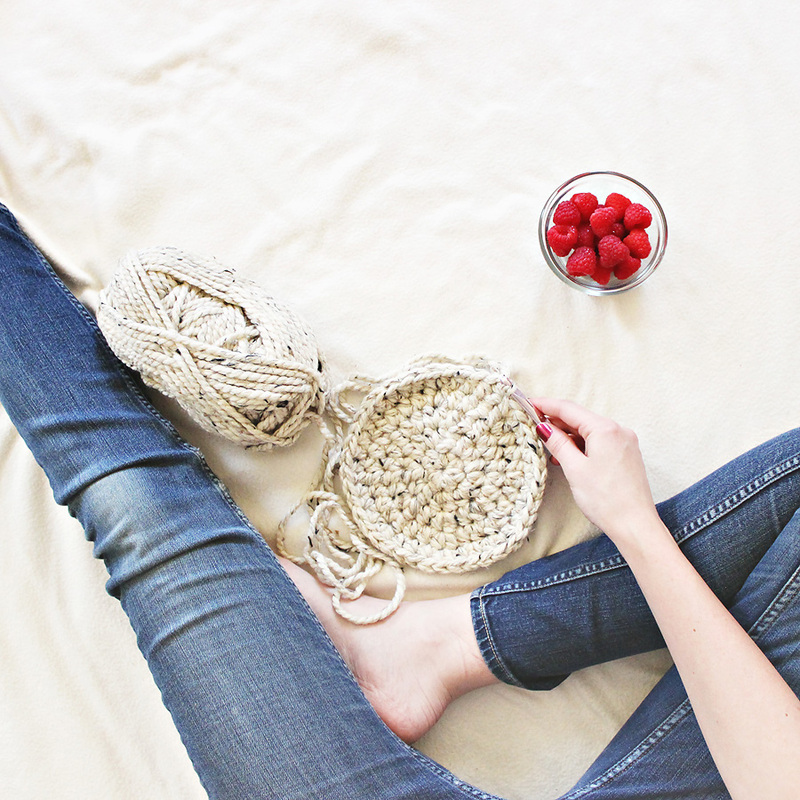 (Sorry if I'm totally destroying the illusion of us creatives just relaxing at home all day with our yarn and needles while a hired professional photographer takes our photos on whim. These things take a lot of planning and sometimes a lot of time.) It's a bit of a process but so worth it. So terrible. So blurry. Color looks off. You can't even see all the cute details in the pineapples. This was the straw that broke the camels back. And here's a little preview what my feed is looking like currently with pictures taken with my camera. Ahhhh so much better. My heart is happy. I still have such a long way to go and a lot of hopes and dreams for my instagram account but I can't believe how far I've come in just under a year. I'm crazy excited about using my camera for my Instagram pictures and just wanted to share this little trick with you darling people in case it could be helpful in any way! Hello! I'm Megan. I'm a wife and a mama to a darling baby girl. 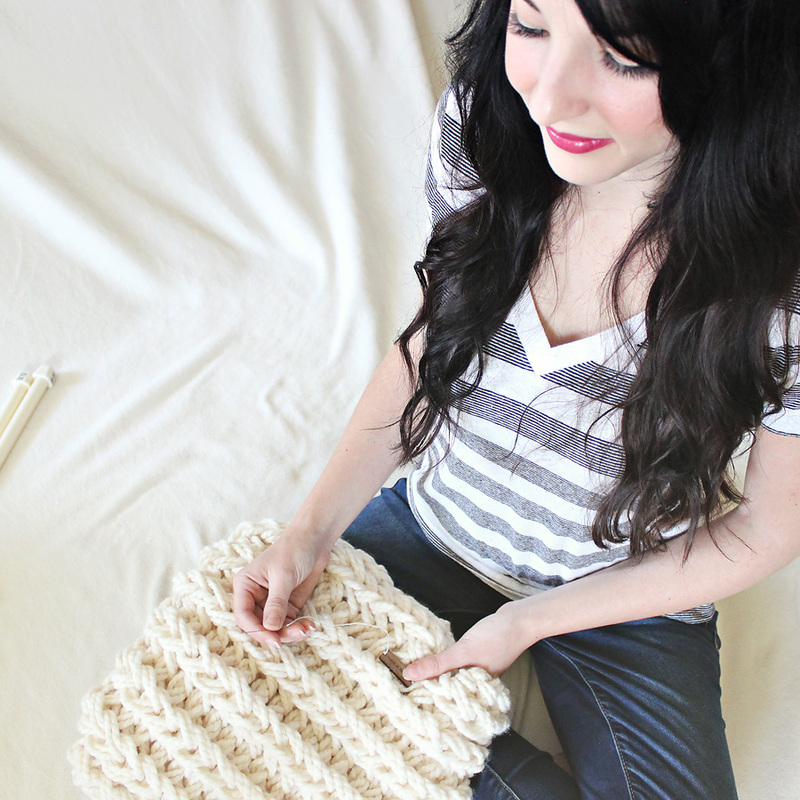 I have a serious affinity for all things yarn related, and I run the crochet shop Darling Be Brave. Let's just be honest here, I'm not totally sure what I'm doing with this blog/website thing yet. But in the future I totally plan on figuring out newsletters so if you want to be apart of that magic when it happens, go ahead and subscribe below! It would totally make my day.